Yesterday I had the privilege of attending a school administrator workshop about using cell phones in the classroom with our high school civics teacher, Mike Elston. I had known about many different class polling tools and had used cell phones in the classroom before, but this training really allowed me to think about and brain storm some really unique ways to use it. It was a great day of learning, sharing, and collaborating. The awesome part is that application of the knowledge from the conference has occurred and students' learning has increased because of it. This morning I was getting ready for class and Mike came into my office and asked for a projector and a screen. Not an odd request, but an interesting one considering that he already has a SMART Board in his classroom. So I asked him what he was going to to with it and he said, "Set-up PollEverywhere for his class." My first response, "I can't wait to see this." What Mike is doing right down the hall is so cool. He is showing the State of the Union Speech on his SMART Board and all of his students are on their 1-1 school-issued laptops. Each student is open to the PollEverywhere question that Mike set-up for his class asking for general responses and reactions to the speech. 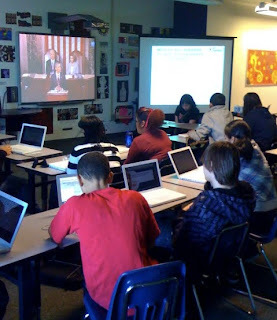 The students are watching the speech and commenting in real time to each other using PollEverywhere. They are having an awesome, high level discussion about the material and are truly engaged in the content. Real learning is happening in front of my eyes and it is so cool to watch. As the techie I always search for another cool or more engaging piece of software for Mike to use and engage his students. Immediately I thought of performing the same open question style conversation using Blogger I asked him why he was using PollEverywhere and not something like Blogger or another real time chat piece. He said, "I love the anonymous part of using this website [PollEverywhere]. In a Civics class students that lean one way or the other on the political scale need to be free to express what they think without being ridiculed, which may happen if we used something like Blogger." I thought that was an awesome comment and a great use of the technology appropriately. So my hat is off to Mike for taking what he learned yesterday and improving his students' education in a new and engaging way today.